Tension beclouds Ayetoro, a coastal community in the oil-rich llaje Council Area of Ondo State over the three-year Ogeloyinbo Obaship tussle. Supporters of the two gladiators, Prophet Oluwambe Ojagbohunmi and Oba Micah Olaseni Ajijo, may take laws into their hands if the contentious obaship stool remains unresolved by the state government. Reports had it that while Prophet Ojagbohunmi is popular amongst the people of the community, the former diplomat, Oba Ajijo, although recognised by government, is only popular amongst the elite who are in the minority. Prophet Ojagbohunmi was last year accused by the other faction of embarking on a self coronation exercise, thereby violating the peace agreement reached with Oba Ajijo and the state government, represented by the Deputy Governor, Mr. Agboola Ajayi. Recall that the kingship crisis in one of the last surviving communist community said to have come to being in 1947 by some Christian adherents on the principles of justice and equity, dates back to 2015 when the last king, Oba Gad Asogbon died. The people of the community established a church called the Holy Apostles Church to further unify them and since then, all decisions therein have remained binding on the people of the community. 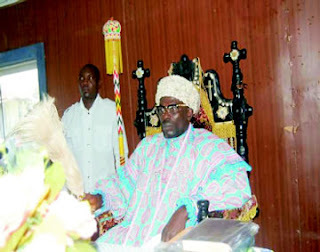 The community had been in crisis for three years now over the emergence of Oba Micah Olaseni Ajijo as the Ogeloyinbo and Spiritual head of the Holy Apostolic Church Ayetoro community. Traditionally, the community had always been under the sole authority of the Ogeloyinbo, who also doubles as the spiritual head of the community church in the enclave. However, the narrative changed for the first time, as a division was introduced when Prophet Ojagbohunmi emerged as General Overseer of the Holy Apostolic Church and Ajijo became the king. This separation of power had been the crux of the matter leading to palpable tension and had snowballed into a court case which may lead to bloodbath if not well managed by government. Findings showed that Prophet Ojagbohunmi was invited to a security meeting by Governor Rotimi Akeredolu at lgbokoda via a letter by the Ilaje Council Chairman, Otito Atikase, only to be whisked away on arrival for the meeting and detained by the Police and docked at the Akure Chief Magistrate’s court. The supposed meeting used to lure him out of the community was to hold on the 9th but later rescheduled for 14th January. Charges against monarch Police Prosecutor, Olatunji Kazeem said the defendant with others at large while being armed with guns, cutlasses and other dangerous weapons, did rob one Ajimijere Ayodele of Tiger Generator and a sum of N160,000. Ojagbohunmi was also accused of shooting one Olu Obolo in the leg and cutting him at the rear pelvic girdle with a machete, thereby committing an offence contrary to and punishable under section 320 (1) of the criminal code cap 37 volume 1 Laws of the Ondo State 2006. The counsel representing the defendant, Olusola Oke said his client was not properly served with the charges as required by the law and pleaded with the court for some time to file necessary application for the bail of the defendant. However, the Police Prosecutor insisted that the defendant should be remanded in prison custody pending the hearing of all the necessary bail application but the Chief Magistrate, Mayomi Olanipekun declined and ordered that defendant be remanded in Police custody and not prison custody as requested by the Police. Reacting to the development, the Principal Secretary of the Supreme Council of Elders and the entire residents of Ayetoro, Mr. Ademolu J. Atimishe said the whereabouts of their traditional ruler, Prophet Ojagbohunmi remained unknown since he received an invitation for a peace meeting with the state government. Allegations untrue Also, the spokesperson of Prophet Ojagbohunmi, dispelled the allegations against the prophet, insisting that his coronation was legal and in line with their tradition. Akinluwa said that the “mandate had been given to Oba Oluwambe Ojagbohunmi and we are committed to defend it any time and anywhere". "Our fundamental human rights must be protected. The people of Ayetoro community had chosen their king. The will of the people must prevail. We must let the general public know that no amount of intimidation, false accusations and prosecutions can change the mandate and the people’s will".